Summer, 1981. Gather 'round the bonfire and party like it's the second last night of camp! The campers are all in their bunks and the counselors are enjoying one final evening of debauchery, complete with air guitar, actual guitar, s'mores, Polaroid pictures, dancing, sexual confusion, and, of course, copious amounts of drugs and alcohol. 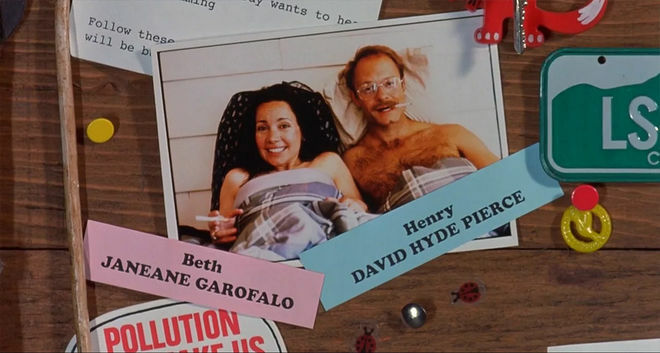 Fueled by the sweet, sweet sounds of Jefferson Starship and red, white, and blue Cooper Black type, the opening title sequence of director David Wain's Wet Hot American Summer introduces viewers to the ridiculous world of Camp Firewood and its hard-partying counselors. Played by a group of actors all at least 10 years too old for their respective roles, the cast includes a number of future stars, like Paul Rudd, Amy Poehler, Elizabeth Banks, and Ken Marino. And yes, that's a young Bradley Cooper in his first big screen role. A commerical and critical failure at the time of its release, Wet Hot American Summer has since become a cult classic and even spawned a prequel series — starring the same group of now much older actors — set to debut on Netflix in 2015. Now if you'll excuse us, we're going to go fondle some sweaters.